At present, we are concerned primarily with two things: one, ourselves; and the other, the place where we live. In other words, we are concerned with two objects: namely, everything that is related to our gross and subtle bodies; and the world at large, with all its paraphernalia. But there are others above us, the transcendentalists, who are concerned not only with their body and mind and the world at large, but also with the transcendental subject that is above the body and mind and the world at large. The transcendentalists are very much concerned with the Absolute Truth, and much less with relative truths. These transcendentalists (ordinarily known as saints, philosophers, reformers, messengers, and so forth) appear in various places in the world at various times. They render transcendental service to the Absolute Truth and to humanity, also, by preaching the message of the transcendental world. According to these transcendentalists, even lower animals like cats and dogs are also concerned primarily with two things, namely, themselves and the world at large. Living entities other than human beings have no capacity to understand transcendental subjects. The human being is therefore considered to be the highest of all creations, and we must understand the nature of this higher standing. When man, who is the highest of all created beings, is fully developed in consciousness, he concerns himself not only with his own self and the world where he lives, but he tries to understand the Absolute Truth. The Absolute Truth regulates man as well as the world, and knowing Him, the transcendentalist regulates his activities on the right path. This regulating process is commonly known as a system of faith or religion. All over the civilized world we find some process or form of religion—when man is devoid of any such religion or of transcendental traits, he is nothing but a beast. This subject matter, which the religionists delineate according to different countries, times, and people, is more or less aimed at the objective of the Absolute Truth. The Absolute Truth is one without a second, but He is viewed from different angles of vision by different religionists or transcendentalists under different circumstances. Some transcendentalists view the Absolute Truth as an impersonal force, generally known as the formless Brahman, while others view Him as the all-pervading localized aspect, dwelling within all living entities and generally known as Paramatma or the Supersoul. But there is another important sect of transcendentalists, who understand the Absolute Truth as the Absolute Personality of Godhead, possessing the potentialities of being impersonal and all-pervasive simultaneous with His Absolute Personality. Thus, the human race has descended to the qualitative status of the dogs, who are habituated to barking as soon as they come upon another set of dogs who happen to hail from another quarter. We cannot conceive of a greater degradation of the human being than when he is apt to raise a hue and cry as soon as he sees another human being who does not happen to belong to his quarter or his religious denomination. He raises this hue and cry as if he had been faced with a tiger or a wolf. Without transcendental knowledge, the human race has actually become no more than the tigers and the wolves. It is therefore necessary at the present moment to understand something about absolute knowledge if we want to bring the human race back to sanity. Thus intelligent persons or leaders of men should not devote their energies only for worldly betterment in the matter of eating, sleeping, defending, and gratifying the material senses. Leaders who think a hungry man or woman has no use for God and religion should be told emphatically that no man or woman in the world is not hungry—and that it is precisely the hungry man or woman who has to understand the meaning of God and religion now, more than ever. In this connection, we would like to quote the substance of a speech delivered by Sri Radhakrishnan (former president of India) at a recent meeting of UNESCO in Paris. He said that when a nation proudly turns away from God and concentrates on worldly success and prosperity, it meets its doom. What is essential today is not so much the rehabilitation of schools and libraries or shops and factories but the rehabilitation of man; we must re-create man if we are to create a new world community. It is therefore more necessary than ever to realize the all-important relationship of man with God if we want at all to rehabilitate the human race, which is already shattered more than ever. The philosophers and the logicians have tried to understand the intrinsic relationship of living entities with God by various conceptions and methods, on the strength of their mundane education and scholastic research. But the Absolute Truth remains above the philosophers and their acquired knowledge. The conception of the Absolute is never perfectly attained by such an ascending process, because of its being born of imperfect, material senses. These empiric philosophers and logicians cannot realize their imperfection by the vanity of material knowledge, and the ultimate conclusion of such materialistic philosophers is atheism. They deny the existence of God, who is the Supreme Person, different from all other persons. Under such a vague assumption, we remain in the same darkness as before. We are content with a conception of Godhead according to our own individual idea, without knowing the real relationship of Godhead and ourselves. Therefore, the transcendentalists do not recognize such a process of generalization but pass over direct perception to receive the knowledge of deduction in its various stages—from authorities who have actual revelation of transcendental knowledge. This revelation is made possible from the deeper aspect within the human personality. The real knowledge of the Supreme Personality of Godhead and His relationship with us can be revealed only by this transcendental method. 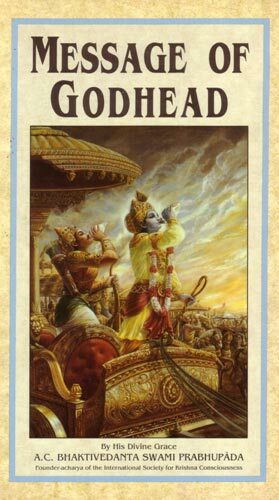 Since the Supreme Personality of Godhead is absolute, He reserves the right of not being exposed to the mundaners. He can be known by one absolute process, and the relative process of sense perception cannot reach Him ever. If Godhead were subject to being revealed by our relative sense perception, then our sense perception, and not Godhead, would be absolute. The process is therefore fallacious in all its manifold stages. We cannot approach the Absolute by our poor fund of knowledge, but the Absolute becomes revealed out of His own mercy by His own appearance. In the darkness of night, the sun cannot be obliged to appear, even by the power of our highest technology. But in the morning the sun reveals itself of its own accord without the help of any materialistic enterprise of ours. When the sun appears, the darkness of the night automatically disappears. It is therefore a truth that the Supreme Personality of Godhead Himself or His confidential servants manifest themselves by their own potency and without any help from this material world. They descend out of their causeless mercy, just to benefit the fallen souls who are apt to be illusioned by the material energy of Godhead, called the modes of nature. However, if we keep our doors and windows shut when the sun rises in the morning, surely the rays of the sun will not enter into our somber room. In the same way, when the Supreme Personality of Godhead or His confidential servants manifest themselves and preach the message of Godhead, we must not shut the doors and windows of our body and mind; otherwise, the light emanating from the Lord and His servants shall not enter into us. The lights that emanate from such transcendental sources generally enter into us by our aural reception. So only if we are ready to offer a submissive aural reception to the message of Godhead can we know Godhead as He is and our relationship with Him as it is. This message of Godhead is presented herewith in that transcendental spirit, for the benefit of people in general and real seekers of truth in particular. We do not know how far we shall be successful in our tiny attempt, but we must always apologize for all our defects in this respect. The influences of various peoples, places, and times have led us to designate ourselves as Hindus, Muslims, Christians, Buddhists, Socialists, Bolsheviks, and so forth. Specifically in the field of religion, we have tried to establish many varieties of ephemeral physical and mental arrangements, varieties of denominations, according to various peoples, places, and times. And precisely for this reason, we can envision ourselves “changing religions.” One who is a Hindu today may become a Mohammedan the next day, or one who is a Mohammedan today may become a Christian the next day, and so on. But when we attain transcendental knowledge and are established in sanatana-dharma, the actual eternal religion of the living entity—the spirit soul—then and then only can we attain real, unidentifiable peace, prosperity, and happiness in the world.